Published in the Dover Express, 13 March, 1981. The site selected for this Methodist church was a commanding one, and the building a credit to the neighbourhood. Its length and breadth is 61 feet by 37 feet, and, as built, the church, which was damaged during the Hitler war, had accommodation for about 600 people together with several subsidiary rooms for classes and for the Sunday school. The foundation stone was laid on the 6th of May, 1901, by the Mayor of Dover, Councillor W. J. Barnes, J.P. The builders were two members of the Society, Mr Charles Lewis and Mr G. Brislev. It was opened on the 1st of January, 1902, by the Mayor, Mr Alderman Martyn Mowll, and the members of the Dover Corporation attended in state, the Mayor delivering an appropriate address on the occasion. The financing of the undertaking was organised by the Rev I. Dorricott, then the minister In charge, who stated that the entire cost of the building had been £5,500, towards which, on the day of the dedication, they had secured £3,000, made up of £1,000 from the Primitive Methodist Mission Fund, £450 from the sale of Peter Street Chapel, and the remainder derived from local subscriptions. Bartholomew Street, Beaconsfield Road, Churchill Street and Granville Street were built on a piece of land on the east side of London Road long known as Bartholomew’s Close. It formed a part of Mr. W. Kingsford’s purchase in 1811 and was laid out for building by Mr S. C. Tucker who submitted the plans to the Town Council in May 1866. He proposed to name the streets Bartholomew Street, Barton Street, Beaconsfield Road and Paul’s Street but subsequently, to prevent confusion with existing streets, Paul’s Street became Churchill Street and Barton Street was changed to Granville Street. Very little building was done for several years, but in 1880 the whole of the four streets were laid out. Churchill Street was opened into the London Road in 1882, the Town Council paying £200 towards the cost. One of the buildings in Granville Street was the old Granville Street Boys’ School, erected in 1875 by the Dover School Managers’ Association, of which the late Canon Puckle was the chairman, and the late Mr. W. R. Mowll, J.P., and Mr. Thomas Lewis, Clerk of the Peace, were the organising secretaries. Beaconsfield Road followed the line of an old footpath, which then crossed the river by a footbridge. Only the south side of Beaconsfield Road was built upon at that time, the plans being accepted on the condition that the road should be widened to 40 feet when the north side, then the Dover Cricket Field, was used for building purposes, and that was later done. The laying out of Bartholomew's Close for building added about 106 houses for artisans to the London Road district. Just within the boundary of Buckland, the London Road has, on its west side, a terrace which rises eight or nine feet above the main road, and is supported by a strong retaining brick wall. This is Buckland Terrace, from which led an old bridle path or track along the foot of Chapel Mount to agricultural land beyond and ultimately to Hougham. The lower part of this road, and the hill beyond, has had various names. Where it leaves the main road it has always been Chapel Hill, that name being much older that the old Wesleyan Chapel, on which it abutted, having been derived from the ancient Chapel of St. Bartholomew's Hospital. The green eminence when St. Bartholomew’s Hospital existed, was called “Spital Down." That first meeting place, in the occupation of William Farr, was of course not a chapel, and its actual situation is not known; but a few years later — some records say in 1808 and others in 1810 — the first Wesleyan chapel at Buckland was built, being the building on the east side of the London Road, later used as a Sunday School and for other purposes. It was but a small edifice, measuring 33ft. by 36ft., affording accommodation for about 200 worshippers. A larger building an the opposite side of the road, abutting on Buckland Terrace, was built in the year 1839. It was one of a number built in celebration of the centenary of Wesleyan Methodism. The resolution to build it was made at a circuit meeting held at Lyminge on 30th April, 1839, and tenders for the work were invited in June, 1839, according to plans and specifications drawn by Mr. F. Hight, architect, of Dover. The work was immediately afterwards put in hand, and the chapel was completed and opened on the 19th of December, 1839, the structure having cost, including the land it occupied, £1,839. It is curious that the figures of the date and the amount (which we believe are correct) are exactly the same. It was considered at the time that the edifice, which was substantial, though very plain except in front, was built at a very modest cost, towards which £163 was collected at the opening services. The old Buckland Wesleyan chapel, soon after it was superseded, was used as a day school as well as a Sunday school, but after the opening of the new parochial schools at Buckland it was only used as a Sunday school. For that purpose, in 1885, it was enlarged by being carried 12ft. backwards and by the addition of a separate building at the back for class meetings. The foundation stone of this work was laid on the 22nd of May, 1885, by Mrs. G. S. Tyler, daughter of Mr. George Flashman, who contributed £225—nearly his last contribution before his death to the cause to which his generosity had been, during a long life, largely devoted. When St Bartholomew’s Church opened in January 1879 some of the church furnishings were incomplete. There was no pulpit and £1,400 was still outstanding towards the cost of the building. This elaborate wooden screen erected beneath the chancel arch, topped by an ornate cross, was not installed until some time later. 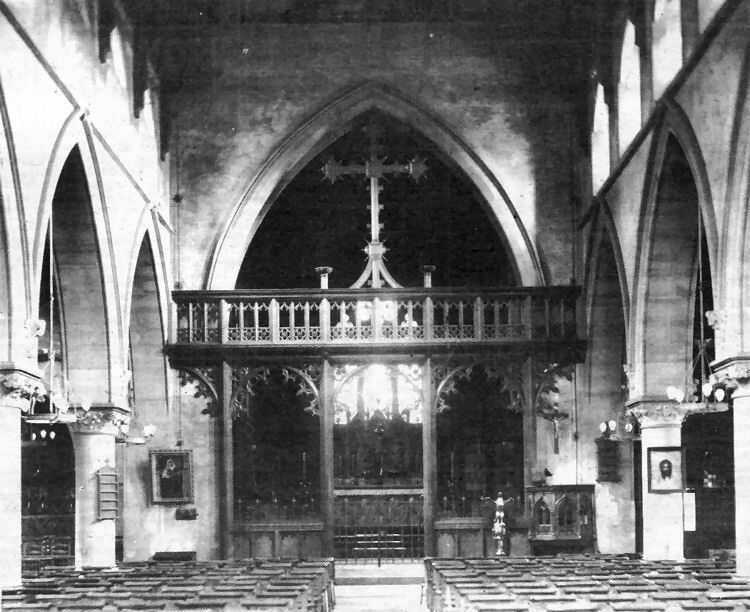 A photograph showing the interior before the screen was erected appeared in Part 163. The cost of building the church was £7,500 and the first contract let was for constructing the nave and chancel only, at a cost of £4,362. The generosity of a Miss Hunt however, made it possible to build the north aisle and provide the attractive sculptured reredos and stained glass windows in the chancel- One window was the subject of some controversy. The Virgin Mary was considered to be too dominant in one window and the Archbishop of Canterbury ordered its removal, but this was not possible before the consecration ceremony. The Vicar, however, gave an undertaking that it would be altered as soon as possible. Other gifts met the cost of completing the church.